Thu, Sep 13, 2018, 08:24 pm SL Time, ColomboPage News Desk, Sri Lanka. 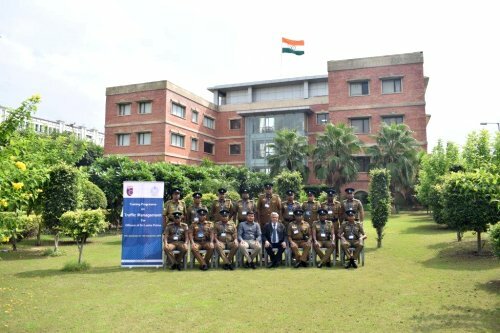 Sept 13, Colombo: A team of Sri Lankan Police Officers is participating in a comprehensive training program on Road Safety and Traffic Management at the Institute of Road Traffic Education (IRTE) in Faridabad, India. The course is being organized from 3rd -14th of September. The Institute of Road Traffic Education was founded in 1991, and is an active member of the United Nations Road Safety Collaboration and the Commission for Global Road Safety. It is recognized as a center for road safety research and analysis, working towards the development of traffic management systems that can be implemented in India and other countries. The training program is fully-funded by the Government of India. The 15 officers, ranging from ranks of Chief Inspector of Police, Inspector of Police, Sub-inspector of Police, and Police Sergeant, are participating in the program. The Government of India provided complimentary travel and accommodation, as a gesture of strengthening people-to-people contact between India and Sri Lanka. Several other training programs such as Crime Scene Management and CCTV Analysis, Expert Testimony on Criminal Trial, Forensic Science, Cyber Forensics, and a seminar on Financial Crime, have been organized by India for Sri Lanka's Police Force this year.